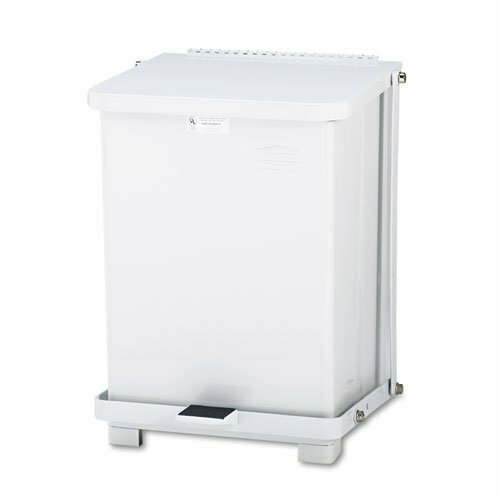 Rubbermaid Commercial FGST7EPLWH Steel 7-Gallon The Defenders Step Trash Can with Plastic Liner, White, The Defenders step cans are 7-gallon square steel step cans with a foot pedal. The Defenders medical step cans have a piano hinge lid restraining mechanism to prevent lid from traveling backwards. They comply with OSHA standards and Federal OBRA regulations and are UL- and State Fire Marshal-listed and FM-approved. They have a white powder coat finish and a rigid plastic liner. 17 inches long by 17 inches wide by 20 inches high. 19 pounds. Made in the USA. The Defenders step cans are 7-gallon square steel step cans with a foot pedal. The Defenders medical step cans have a piano hinge lid restraining mechanism to prevent lid from traveling backwards. They comply with OSHA standards and Federal OBRA regulations and are UL- and State Fire Marshal-listed and FM-approved. They have a red powder coat finish and a rigid plastic liner. 17 inches long by 17 inches wide by 20 inches high. 19 pounds. Made in the USA.